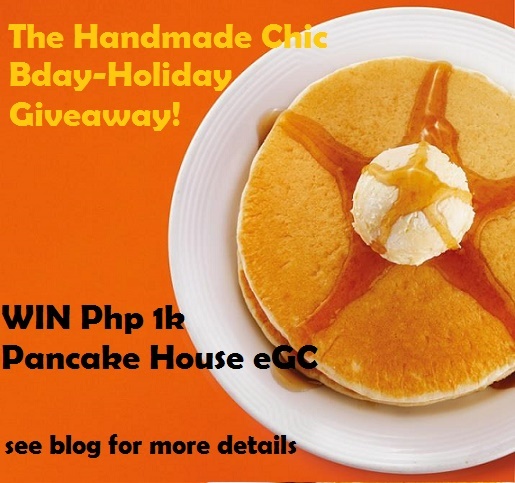 Home / GIVEAWAY / CLOSED: Win Php 1000 Pancake House eGC! Birthday and Holiday giveaway 2015! CLOSED: Win Php 1000 Pancake House eGC! Birthday and Holiday giveaway 2015! Hello everyone! Since my Birthday is coming up next month and Christmas is just around the corner I think its a great time to have a giveaway! Since Im here in China with my husband and i have an Electronic Gift Card (eGC) sitting in my email. Well I think its nice to have a giveaway! Since this is an eGC i will send it the day after i receive the details of the lucky winner! 75 comments on "CLOSED: Win Php 1000 Pancake House eGC! Birthday and Holiday giveaway 2015!" Who will you dine with if you win the eGC? My son and my mom. Thank you for the giveaway! Godbless! If ever I win I will dine with one of my officemates who has been there for me in my time of distress. My Hubby and my daughter. Thank you for this giveaway. Will dine my fam ofcourse will share this treats if i win! Wow, nice. I wish, I'll win this one. more power!!! Definitely, dine this with my family. With my kids who loves Pancake House dishes. The most important to me.... My Family! i will dine with my hubby and my kids..thanks for a chance!! I will share it with my wife for an early breakfast in Pancake House. I will dine with my other half and six-year-old daughter. If I win the eGC, I will treat and bring my mommy( the grandma of my two boys) who is 79 years old to the Pancake house and let her order the food she want to eat! I would love to dine with my mom and kids..
Would love to dine for free with my FAMILY at TPH! i would love to dine with my daughter! Definitely,I will dine here with my family. My Husband, for our 4th wedding anniversary, and i want to celebrate it in Pancake House. Sana ako ang mapili na manalo para maitreat ko si hubby sa darating nyang birthday at 11year anniversary namin. At alam kong magiging memorable ito. If I win the eGC, I will dine in Pancake House with my family. I'll take my mom with me! I will take my mama on a date! i would love to dine with my wife! I would love to treat my mom because it's been a long time since we had a quality time together. I will dine with my kids. My daughter's favorite, I'd love to win this! i will dine n with my family. Dine with my lovely wife for our monthsary. I will dine it with my husband! It's our 3rd anniversary yesterday Nov 25th!